The Edimax N300 Universal Wi-Fi Extender does exactly what it’s advertised to do, and does it extremely well. The instructions are well written and very easy to follow, allowing the end user to have the Extender up and running in a matter of a few minutes. If you own a wireless router with the WPS function, setup is insanely easy, even for those who are not so tech savvy. Even without the WPS feature, setup is still rather simple, because the browser based interface will do most of the work for you. The integrated LAN port adds to the flexibility of the Extender by allowing you to use it with devices that are not wireless. This is a unique feature that many desktop PC owners will find useful, especially if you want to locate a PC in a room with no LAN jacks. The compact size of the Extender, and the fact that it plugs right into an outlet with no other wiring required, means you can use it just about anywhere. If you have been looking to increase the coverage area of your wireless network, and want a product that simply works right out of the box, then you need to grab one of these, NOW! At a price ranging from $30 to $40 USD (Depending on where you purchase from) it’s certainly an affordable way to extend your wireless capabilities. 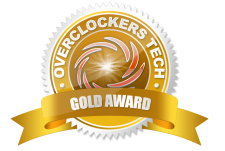 Based on value, performance, ease of installation, and the fact it does exactly as advertised, the Eidamax N300 Universal Wi-Fi Extender has earned the Overclockers Tech Gold Award!